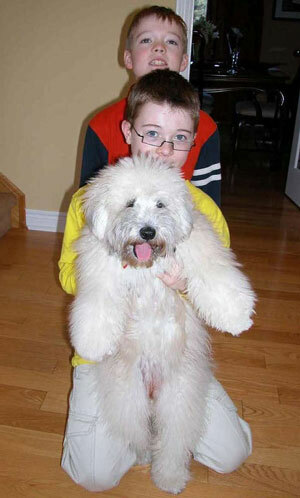 Meet Bella, a bouncing bundle of fun and a sheer delight for the MacIntyre family of Ontario, Canada. Bella likes people, dogs, her toys, and especially, her bed. She likes playing, going places, and just hanging out with the family. Bella was raised by a breeder who offered her puppies early social experience with people and dogs and who took care to match the right puppy with the right family. When Bella came to live with the MacIntyres, the family wanted her to be happy both by herself and playing with the family's two boys, Austin and Jordan. One of the most important things the MacIntyres did for Bella was to train her using positive methods, including clicker training. This early training gave Bella self-control and the ability to settle and calm herself. It allowed Bella to live as a beloved family member within the limits and boundaries that successful parents and dog owners set for their children and pets. With this preparation, Bella was able to have many positive experiences, both with her family and on many visits outside her home. Regardless of a dog's breed, size, or age, he can benefit from good leadership, household rules, exercise, and training. Whether your training goal is to have a high-scoring obedience competitor or a dog that is a well-mannered family member, the fundamental ingredient for success is the same. The bond between you and the dog will pave the way to training success. 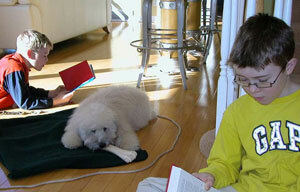 Teaching basic skills by positive training can begin in early puppyhood and continue as the dog matures. While your dog does not need to learn a large number of tricks or how to heel perfectly, he does need to know the fundamentals: how to sit, say please, walk on a leash, have good manners in the house, greet people respectfully, and settle himself on a mat or in a crate. He also needs to learn not to guard his toys, food, or bones, and to enjoy attention from people. A positive dog trainer can help with exercises designed to teach all these things. Training is a daily, ongoing process and is not restricted to certain times or places. It is a great idea to set aside a few minutes each day for formal training sessions and hugely beneficial to attend group training classes, but it is also important to realize that every interaction with your dog is a training opportunity. Clicker training is a positive training method worth serious consideration. Clicker training is a powerful, yet gentle, way to train dogs (or any creature). This method promotes the development of a strong bond of love and respect between dog and trainer, producing almost magical results. Imagine a dog that can't wait to train with you, tries his very hardest to do what you ask, thinks for himself, works out problems, gives you insight into the inner workings of his mind, and learns at an accelerated rate. This is a clicker dog! Clicker training is a science-based method that uses positive reinforcement as the primary teaching tool. The trainer uses a handheld clicker to tell the dog, "Yes! That was right" at the precise moment he performs the correct action. The dog gets a food treat immediately after every click, which soon builds a positive association with the click. The click is so precise and clear that it helps the dog sort out his behaviors without the need for punishment or scolding.The click is so precise and clear that it helps the dog sort out his behaviors without the need for punishment or scolding. Clicker trainers should be predictable and encouraging. Ask your dog to sit for his dinner and for his water, and before he goes in or out of the house. Praise and give food treats or toys when he comes to you when you call and when he acts in ways that you like. Reduce the potential for bad behavior by supervising, using a crate, putting temptations out of reach, and providing chew toys and lots of exercise. Establish and maintain a loving and respectful relationship with your dog by avoiding punishment, setting clear expectations, rewarding good behavior, and ignoring or preventing behavior you don't like. Clicker training and other positive training methods that use food, toys, and fun to motivate and reward good behavior do not employ force, fear, or intimidation to gain compliance from the dog. Positive trainers do not use choke collars, nor do they growl at the dog, roll him on his back to dominate him, stand over him threateningly, yank him on a leash, shock him, or throw bags of chains at him to show him who's boss. These measures may cause the dog to fear and obey the ruling adult, but they can make the dog downright dangerous for visitors, kids, and weaker family members. Positive training is a partnership in which even young children can participate with supervision. One of the great benefits of positive training is that you can start right away, the very day you bring your puppy home, just as the MacIntyres did with Bella. This type of training helps forge a strong bond of love and respect and creates a safe relationship, especially with children. Because dog and trainer work together toward the goal of success for the dog, the dog learns to try to do the right thing and to be attentive to the wishes of the trainer. Get the kids involved! Kids make great clicker trainers and experts agree that this is the safest, most effective training method available. Veterinary behaviorist Dr. Gary Landsberg of Richmond Hill, Ontario, discusses clicker training with all of his clients, making sure they understand the importance of using positive reinforcement as opposed to punishment in training. Norma Jeanne Laurette of Kitchener, Ontario, is the president of the International Positive Dog Training Association. She says, "The positive reinforcement of the clicker method prevents the fear, anxiety, and aggression that are often the result of compulsive training. By choosing clicker training, your dog will learn quickly, both you and your dog will enjoy the process, but more importantly, you can create an intelligent dog with a trusting temperament." The time that the MacIntyres have spent teaching Bella to be a good canine citizen, rewarding her for calmness and quiet in public places and during family time at home, teaching her to respond to their requests, and making sure she gets lots of exercise and supervised play time has paid off in many ways. Bella is welcome to visit at friends' homes, the boys can have friends over to play without Bella bothering or frightening anyone, and adult friends can visit the MacIntyre home without wishing that the dog were somewhere else. The MacIntyres go on vacation and come back to a well-adjusted dog; Bella is confident and consistent and her training transfers to the caregiver who watches over Bella while the family is away. A well-trained dog like Bella is a happy dog and a joy to have as a family member. Positive training is fun and well worth the effort for two-footed and four-footed family members alike. Submitted by soldiergirl on Wed, 2010/07/28 - 12:44am. the sd training is going better than obedience training. she has good public access behavior. I've taken her to the dentist and other doctor appt. we go to kniting club and she waits most of the time. she is 9 months and not always sitting when I want. sometimes when were walking especially near a favorite spot she wants to stay and she hates to leave me. how can I help her?